What does it take to save the world, or even a small part of the world? Compassion is the secret ingredient that makes ordinary courage mightier than any sword. 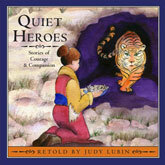 The heroes of these inspiring folktales teach us that true greatness comes when we show compassion in the face of fear, endure hardship for the sake of another and answer violence with peace. Great King Goodness; The Tiger's Whisker; Nesoowah and the Chenoo; The Magic Brocade. Best for ages 7 and older. Waldorf Homeschooling Best for Grade 2.